June is bursting out all over in the Jubilee wood! The trees have exploded into life, their leaves forming a canopy of green in every shade nature can manage. The flowers on the fruit and hazel trees have already started to form into fruit and nuts (see photo below) but the elder flower and privet are still blossoming and feeling the warm air with the sweet scent as you pass by. The flowers at ground level are also putting on a wonderful display, so look down as well! 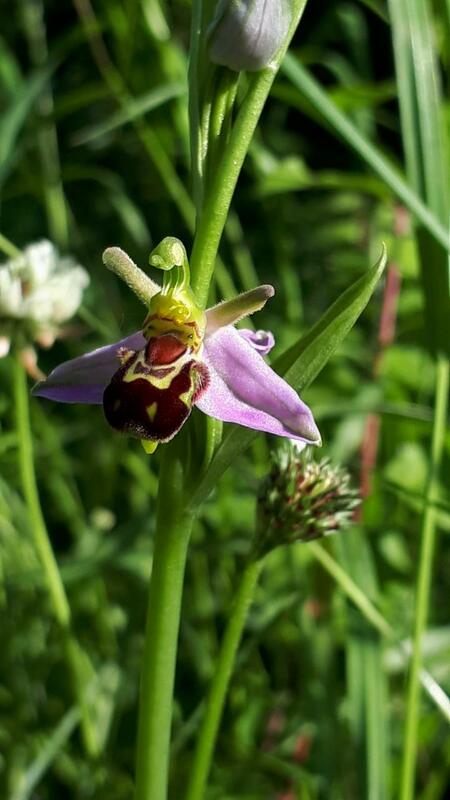 Michael was the first to find the elusive but very beautiful Bee orchid flowering (see photo below). 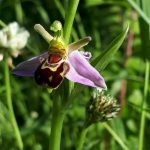 The common orchid is now spreading in the wood and if you look carefully along the small paths of the wood you might still see some in flower. The oxeye daisy is now colonising the wood and as a grassland perennial it flowers from May to September so we can enjoy it for many weeks to come. 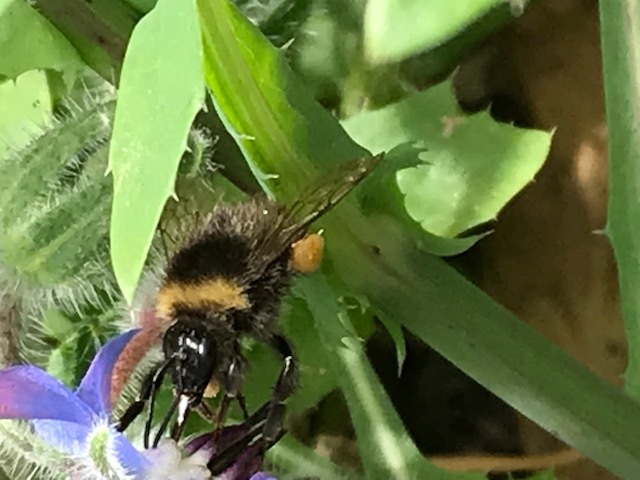 Along with other flowers they attract all sorts of pollinating insects including bees, butterflies and hover flies, so they look wonderful but also have an important job to play in the complex interactions of our environment. 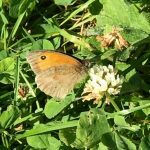 This recent spell of sunny weather and flowering plants has brought out so many pollinators, that as you walk around the wood you can’t help notice the Meadow Brown (Manila jurtina) butterflies as they dart about. 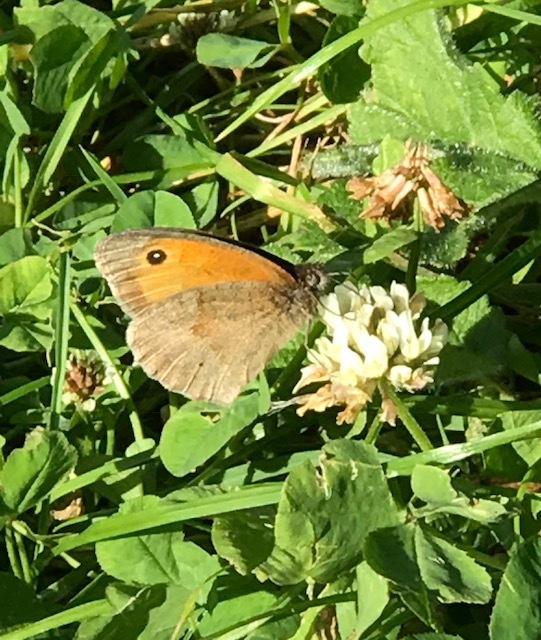 They are small, yellow orange and brown and the forewing has a black spot at the tip but the hind wing is brown, grey and cream. It’s one of our most widespread butterflies and often close their wings when they settle. 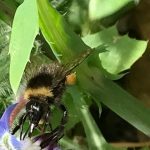 You can help another pollinator by joining in the Great British Bee count at friendsoftheearth.uk as the data they collect will help to monitor how bees are doing. It’s only going for another week so you’ll have to be quick but it provides you with a handy identification chart and lots of information about our busy friends. I was relieved to find that it’s an easy and free App to download! Ok, so you might not believe in fairies but you have to admit there’s a certain type of magic in nature and we have a bit of it right on our doorstep in the Jubilee Wood.